Most of our pets will at some point in their life undergo some sort of surgical procedure. Whether it is spay/ neutering, ear flushes, dental, fractures and breaks, cruciates or other major trauma surgery, the age and health of our pet will determine how well they recover. Most of the AA gang will know that Archie (12 yrs) had to have an emergency spleen removal last week. 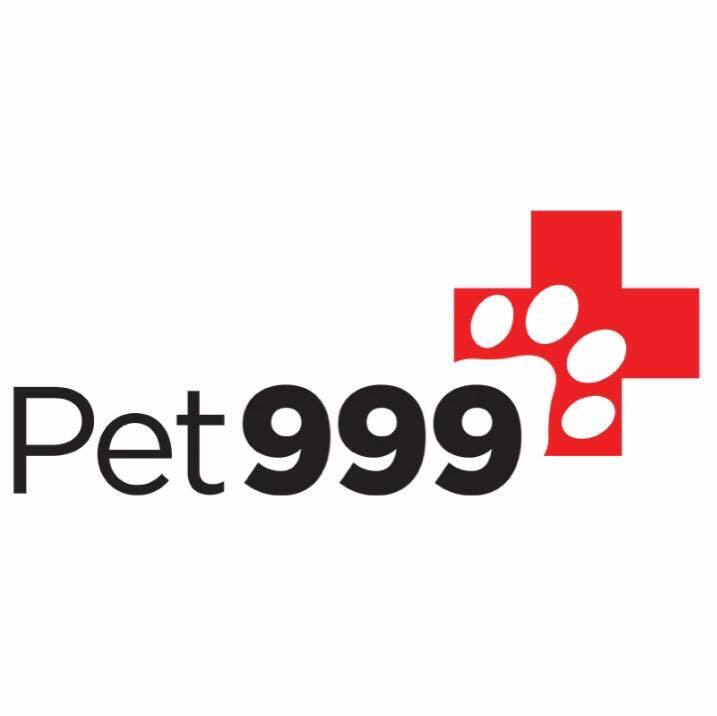 The dreaded conversation with the emergency Pet999 vet, Esme, was around his age, health and recovery chances, and whether it would be fair to put a big dog his age through such a big operation and anaesthetic and rightly so. We all know our own dogs better than anybody else, and I believe with the vets best/worse case medical opinions and our unique knowledge of our pet’s health we can then make better informed choices. That was why I was prepared to take the risks involved with the operation and give him the best chance of survival and recovery. He has been a fit healthy dog for the majority of his life and I certainly didn’t feel that this was his time just yet. So Pet999 operated on him through the night, did an amazing job and his immediate post surgery recovery went very well. 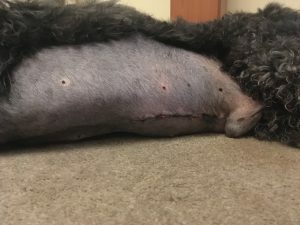 48hrs later I brought him home and wanted to ensure I gave him the very best chance of making a speedy full recovery, so with prior knowledge and consulting the most trusted veterinary holistic healthcare sites along with the vets and nurses post op advice, I put a plan together to aid him. These tips in the main, are for any dog that has undergone surgery but always consult your vet first to ensure that they don’t interfere with medication and or healing for certain medical conditions. 1) The No1 go to for me is Bone Broth. Why ? Because it’s full of the essential amino acids (protein), collagen and glycine in liquid form for building and repairing damaged tissue. This nutrient dense stock is not only protein rich, but contains vitamin C, vitamin D, vitamin K, iron, thiamine, potassium, calcium, silicon, sulphur, magnesium, glucosamine, phosphorus, trace minerals, and glucosamine chondroitin sulphates! Bone broth is a massive immune system booster, which is perfect for helping get your dog back to normal. Because it’s liquid it needs little effort for the digestive system to absorb all the nutrients and with dogs that have no appetite it can be syringed into them via their mouth to help hydrate and stimulate appetite. This can be made at home, and why I always recommend that some is kept in the freezer ready for emergencies when you need it. See Dr Karen Becker’s recipe to make it here: AA do now stock this in frozen form for those that haven’t the time to make it or for those emergencies- just ask one of the team. 2) Easy to digest nutrient dense food – The first couple of days a pets appetite is usually off, so foods that smell appetising and are nutrient dense is a must for me. I always feed small meals often to minimise any digestive issues after surgery or any illness. Examples here are cooked chicken, white fish,small amount of cooked liver (full of vitamin A,D and minerals for repair), mashed potato, lightly cooked eggs and egg yolks, and tinned sardines in spring water are all easily digestible nutrient dense foods that I would give my dogs. You can add bone broth as a gravy to these too. Your vets will also offer post surgery meal options. 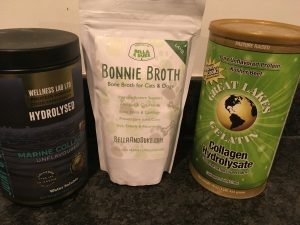 3) Collagen – I use Great Lakes bovine or hydrolysed marine collagen. I have this in anyway for me, but its a great addition to aid recovery as its a complex protein made up of over 1000 amino acids, the main ones being proline, glycine, and hydroxyproline which is easily digested and absorbed in the body. In a nutshell it’s crucial for healthy cell reproduction, connective tissue, joints and a lot more. It’s like a powerhouse for repair. Because of the unique way hydrolysed collagen is prepared, it has higher amounts of the amino acids that support healthy cell growth and reproduction especially in connective tissues, hair, skin tissue, cartilage, ligaments and so on. Always look for pure natural food source collagen. And once your dog is fit and well again, its great for us to have amazing skin …a scoop mixed in a coffee or smoothie in this house ! 4)Rest and Recovery- although usually it’s good for your dog to have some movement to get their digestive system and lymphatic system moving, a lot of rest and sleep is also crucial for repair. A quiet chilled relaxing comfortable bed away from other dogs and distractions, and where you can be assured they aren’t leaping over furniture or attempting stairs. 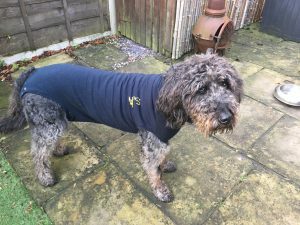 The body suit has been brilliant for Archie, as its comfortable and stopped him from licking his wound. Buster collars and crates are also an option to ensure they are kept quiet and can not get to their wound and stitches. 5) Plenty of water or liquid- Essential to flush the toxins out of the body and keep hydrated at the same time. 6) Medication- Extremely important to get any medication prescribed by your vets into your dog. I always use pate to get tablets down, and it has never failed me to date. But every dog is different so finding an easy to “hide” food that your dog’s will eat is a must. Supplements: Always consult your vet but this is what I’ve used now and in the past. Milk thistle and dandelion leaf – helps support the liver and kidneys for toxin removal from anaesthetic or medication. I use Mercolas Healthy Pets liver and kidney support from healthful pets. Probiotics – a lot of dogs will be given antibiotics ti help prevent infection. The antibiotics will wipe out any bad bacteria but also the good. Hence why it’s always a good idea to add probiotics AFTER a course of antibiotics, or give Kefir to replenish all the good bacteria in the gut. The gut biome is responsible for a high percentage of how the immune system works so ensuring its working well always aids recovery. Coconut Oil – Dogs usually get a bit constipated when they have undergone surgery and had lots of medication. Its essential that their body is able to eliminate the waste and toxins, so by adding some coconut oil to their food usually helps them overcome constipation. Topical: always consult your vet with any topical solutions to the wound. I just kept it clean and free from infection by leaving it alone and keeping the body suit over it for the first few days before the post op check up. Once that was all ok, I opted to rub pure Aloe Vera on the wound in the morning and then pure extra virgin coconut oil in the evening and let that all soak in and get some air. Its anti microbial properties help with healing and protecting from harmful bacteria and also slightly moisturises the scabs so that they don’t crack open and get irritable to the dog. However each dog is different so be cautious incase they begin to lick their wound. Other people swear by Manuka honey and especially for wounds that have become infected and difficult to heal. That is usually available via the vets too. That was all, he’s back to his usual self and all being well his stitches come out on saturday. Hard to believe just over a week ago it was touch and go! The above information is not guaranteed to speed up all surgical operations and all dogs are different in terms of their health, age and breed etc. As always I just post info that I have found helpful for my dogs, but must state Im not a qualified vet so please always consult them and do your own research.